March 3: What’s New in Spiritual Growth and Learning? Spiritual and Growth and Learning is for EVERYONE! It doesn’t matter how old you are. We’ve got something for you! Classes for Children and Youth meet Sunday mornings during worship services. Adults also meet EVERY SUNDAY (9:15-10:15 am) in the MacArtor Library and at various times during the week. Check below to see what’s going on in your class this week! This Sunday (March 3), Children are invited to remain in the sanctuary for an abbreviated, intergenerational worship service as we celebrate the church’s 30th Birthday! Children’s classes will return to regular schedule next Sunday, March 10. Youth are also invited to remain in the sanctuary for the special 30th birthday worship celebration. Sunday morning Youth Group and O.W.L. classes will return to regular schedule next Sunday, March 10. 9:15 – 10:15 We’re continuing our ongoing series, “Spirit in Practice.” This Sunday, Terry continues with part two of our discussion about the role of reason and rationality along the path to the discovery of deep truths. 11:30 – 12:30 New Member Class: The Meaning of Membership Join Rev. Greg for a conversation about what it means to be a member of Mill Creek. NOON – 2:00 Mary Leads the final session of the “Waking Up White” class. (MacArtor Library) Registration closed. Everyone has spiritual gifts…Ever wonder what yours are? Mark your calendars for a fun and inspirational retreat (Saturday, March 9 from 9:00 a.m. to noon). Rev. Robert Broesler, Tracy Morgan and Ram Ray will lead us in a discovery process of our spiritual gifts, followed by a dialogue about ways we can use our gifts to their full potential. We welcome people of all ages. Bring a friend. Babysitting and coffee provided. Click HERE to register. Mill Creek Youth have an opportunity to participate in the “Adopt a Trail” program at White Clay Creek Park! For those of you who enjoy being outdoors, this will be lots of fun – and a great way to bond as a group! Your friends are welcome too! We’ll volunteer once per month during the Sunday worship hour. This volunteer opportunity begins in June. Interested in volunteering? Email dre@uusmc.org. Roots & Shoots Painted Rock Sale – March 10! 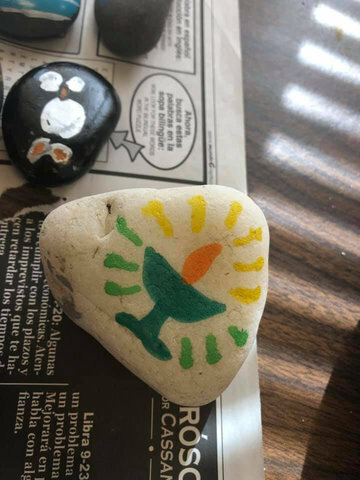 The Roots & Shoots Friends are showing their creativity and love for lemurs by painting rocks to sell to the community to support the Madagascar Biodiversity Partnership. Check out the fun, decorated stones available for purchase in the gathering space next week. Show your support and help save the lemurs! It’s a congregation-wide Sock Hop! …and you’re invited! Join the RE-Imagineers as they host this very special and fun event for all. Music provided by our very own DJ Prakash! Saturday, March 30 6:30 – 9:00 p.m. Admission is FREE.